On our first day arriving in the park, I take the group to Hurricane Ridge. A scenic drive to the heights of the Olympic Range, where Mount Olympus can be seen, with its glaciated peak, and accompanying mountains with several peaks over 2000m. From Hurricane Ridge the view to the southwest shows the Olympic Range spanning 20 miles long, and oppositely, to the North Vancouver Island and the straight of Juan de Fuca offers an overwhelming vista. 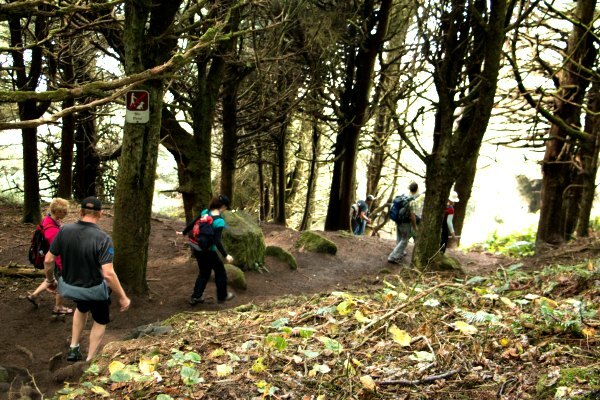 After the first night in camp, the second day will be filled with beaches and rainforests. 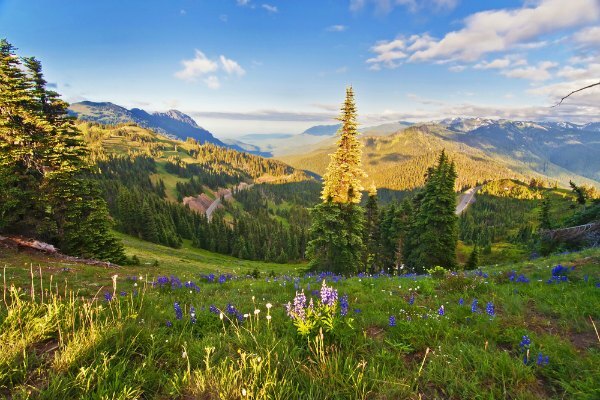 In Olympic National Park, there are plenty of options when it comes to these sights, but there is a spot in the far northwest corner of the park where most visitors never make it, and unfortunately for them (but fortunately for us) they are missing out. Not only is it one of the most beautiful beaches in the park, but it is also well off the beaten tourist trail. As we drive from our camp in Port Angeles we pass through the tiny Native American Fishing village Neah Bay, where a living is still made from the fruits of the sea. Old fishing boats fill the harbor and the blue-collar culture of this town is evident. Only a few miles past the town we reach our first trailhead for the day. 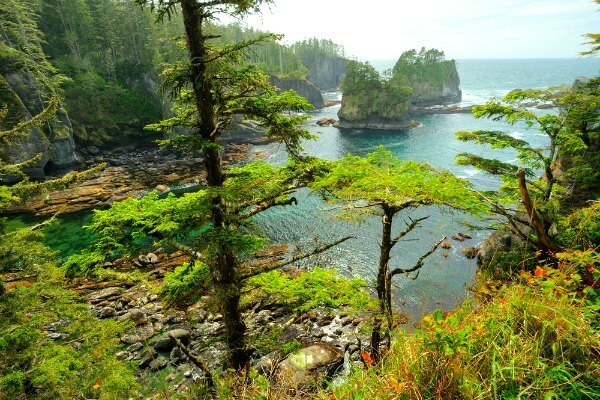 We will be hiking the 1-mile trail to Cape Flattery. 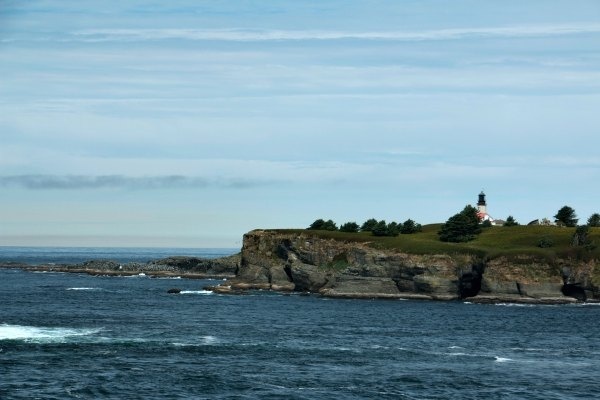 It is the most northwestern point in the contiguous United States, and offers a perfect view of Tatoosh Island and its lighthouse. 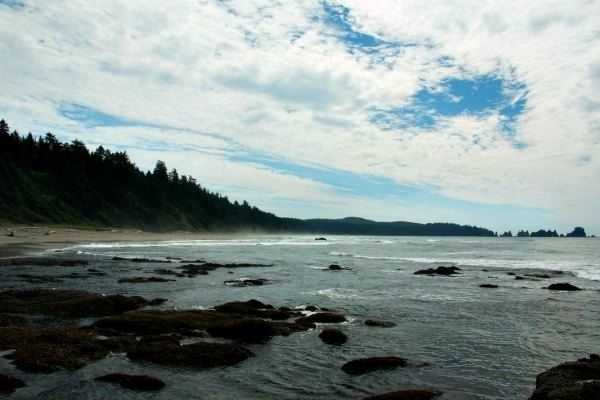 The trail here is through thick and wet forest, with old-growth cedars aging nearly 1000 years old, until you reach the clearing near the sea, and find yourself a hundred feet about the crashing waves looking straight down into the surf. Sea birds of many varieties including muirs, cormorants, puffins and golden eagles soar over-head, and bob through the waves, casually diving and surfacing with beaks full of sardines. A colony of sea lions splash and play on a rock just off Tatoosh Island, seemingly for our entertainment, with the western shore of Vancouver Island as the backdrop. We enjoy the view and marine life for a short while until it is time to head to our next destination. 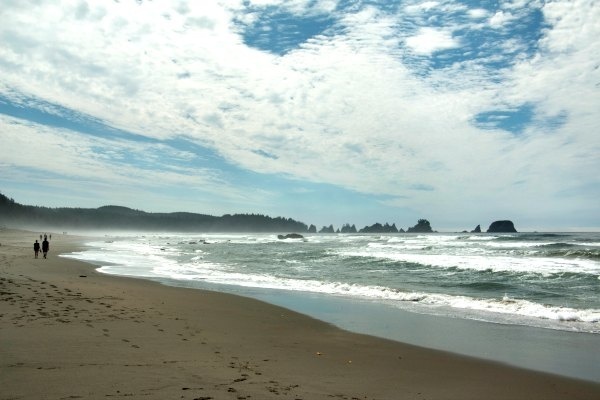 It is a short drive to our next trail head, just a few miles further south on the west shore of the peninsula, back through the Makah Reservation to the Shi Shi Beach trail head. It is with out a doubt my favorite spot in the park. Far from the drive-up photo stops, and crowded trails in the interior of the park, Shi Shi Beach offers solitude, beauty, and a spectacular approach hike. 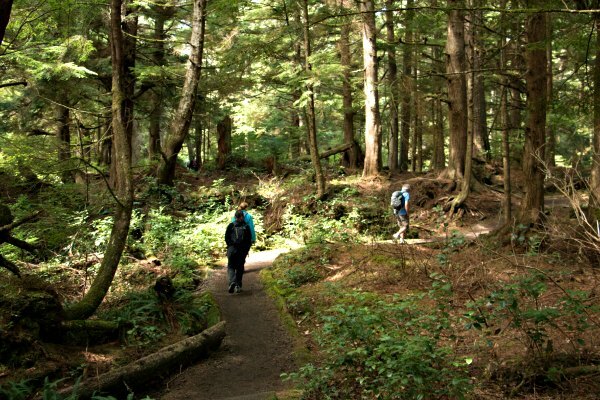 It is about 2.5miles from the trailhead to the beach through spectacular rainforest and old growth trees, across small streams and again to a cliff face over looking the secluded beach. The first views come from high above looking down the beach towards the point of pinnacles. A group of about 20 rock pinnacles, which rise out of the ocean like lighthouses abandoned and long since burnt out. We descend down a steep path to the beach and arrive with excitement. To the south the beach extends another two miles to the pinnacles, and only a few hundred meters to the north a labyrinth of tide pools awaits our exploration. Orcas, sea lions, whales and sea otters can all be seen at times from the beach, and it seems more likely to spot wildlife than tourists. I like to give my group a couple hours to hike the whole beach, explore the pools, and seldomly take a dip in the frigid water.